It is abnormal to start a hike at almost 12,700 feet. The air is fairly thin, there are no trees, and the wind can howl like nobody’s business. This is not terrain for a leisurely stroll, which was good, because we felt like a proper hike up a mountain. 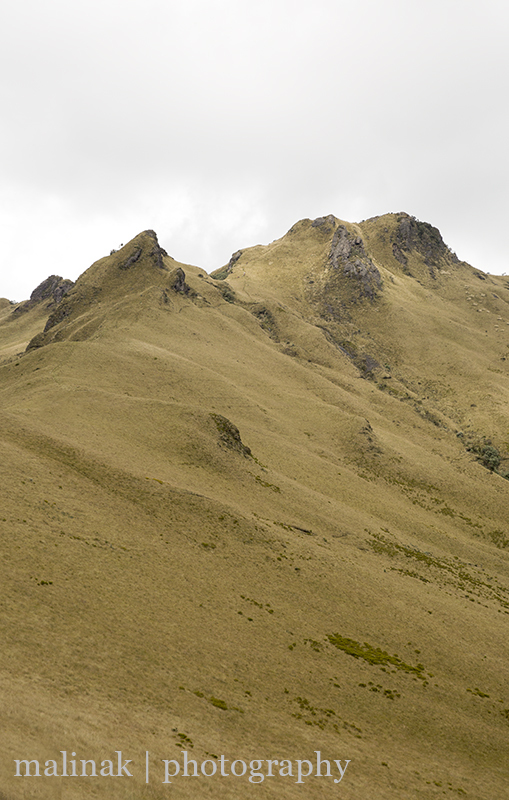 Pasochoa is one of the smaller mountains in the Ecuadorian Andes, but it is also one of the more accessible. It is overlooked by the riches of the Andean Sierra, with seven higher peaks visible from its summit, including Cotopaxi and Antisana, both of which are close to a mile higher. At a mere 13,800 feet, or 4,200 metres, it is a fairly easy, non-technical climb. Instead of climbing from lower down the mountain, which most people do from the northwest side, we drove up through the fields, cattle gates and onto the paramo from the west side. We had been staying on a lovely farm and this access point was just a few minutes up the road so it was ideal. We didn’t expect to be able to drive as far up as we did, but we were grateful given the inclement weather and additional weight of our 16 month old on our backs. 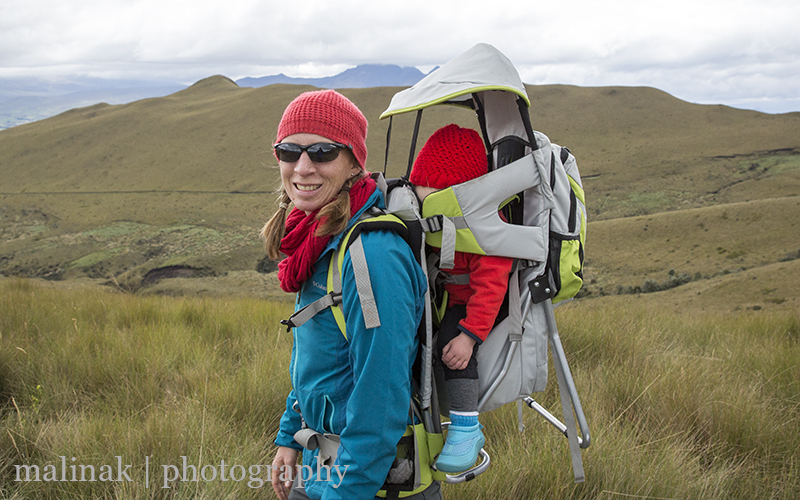 The paramo is a universal ecosystem up in the high Andes and is evident from the tussock grasses, empty spaces and large birds of prey circling above. It is kind of like moorlands and certainly without good visibility, one could easily get lost in the fairly featureless expanses. It was a fairly cloudy day so many of the peaks were mostly hidden, but we still enjoyed being on the lookout for the larger peaks. Really we just wanted to get out and stretch our legs and finally have the chance to summit a proper Andean peak. The open expanses in all directions were quite stunning, it is hard to believe that when you stand atop the summit, it is only about twenty or thirty miles from the centre of Quito. Fog seemed to roll in from all sides, but especially up from the crater of Pasochoa. An extinct volcano, it’s thrilling to see how previous eruptions have moulded the landscape and provided fertile ground for unique high altitude vegetation. All four of us made it up to the top, though Piper was the only one really exhausted from the experience! As you can see – climbing mountains is hard work!